Nothing ruins a camping trip than leaving some comfort of home that you feel you cannot do without. In my case, that is my pillow. Yes, I know I can roll up clothes or fold my arms but nothing fits the bill when it comes to my pillow. While I have suffered and survived from what I like to call the “home blues,” I can promise you I have survived, except one trip. This particular trip I was really suffering from a head cold and needed to elevate my head. While I tried my pack, arms, clothes and a log as a pillow substitute, I never could get it right until I found my cattail fluff. You are probably saying at this point, what? Yes I said cattail fluff. Believe it or not one of the terms used by Native People for cattails can be translated as “fruit for papoose’s bed.” In doing so, I am going to take this “fruit” and create my own pillow. While you can use a pillow case, you probably do not have one sitting around the campsite. 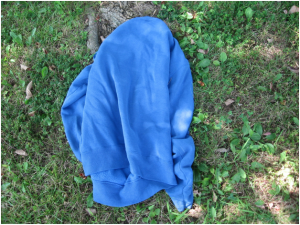 Instead, pick up an old sweatshirt and T-shirt along with a little rope. Now that you have your pillow material, you will also need some rope. Once you have the supplies, except the cattail fluff, you are now ready to create your pillow. To begin this process, one will need to tie off each sleeve at the cuff. Next, put the T-shirt inside the sweatshirt and cover up the neck hole. This later step is very important. If the hole is not covered well, the fluff will come out the neck. Once these two steps have been completed, you will then need to go out and find lots of fluffy cattails. After the cattails have been found, you can begin the harvesting process. What this means is that you remove the fluff from the cattail and place it inside the prepared sweatshirt. The cattail fluff is very fluffy so to create a full pillow one will need to add and push down the fluff. As you do this, work it into the sleeves. Once the sweatshirt is as full as you would like, tie off the end of the sweatshirt with rope. Now that your pillow has been created, it is time to enjoy it. What makes this pillow extra special is the fact that if it gets flat you can simply fluff it up again with more cattail fluff or just shake it up.